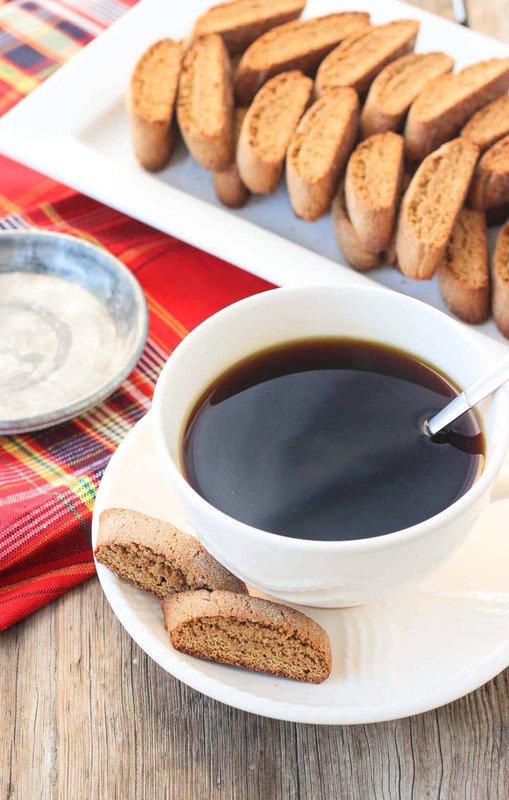 Mini gingerbread chai biscotti cookies are perfect for the holiday season! 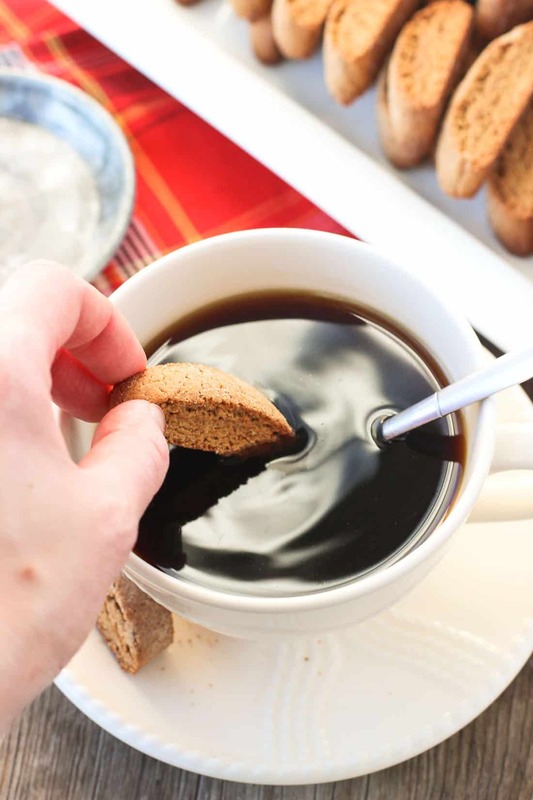 Warmly-spiced chai tea latte mix is a wonderful, festive complement to the gingerbread flavor. 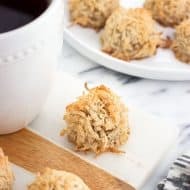 These crunchy cookies are just right for dipping into coffee or hot chocolate, or for snacking on by themselves! 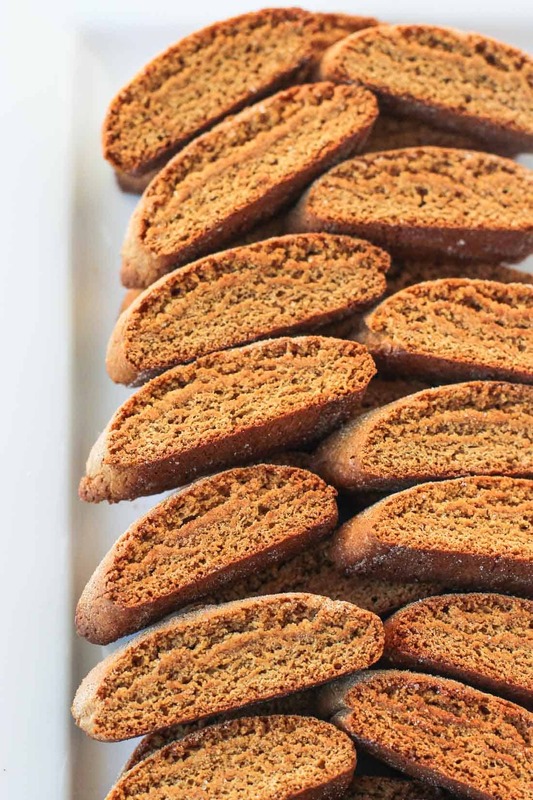 ‘Tis the season for all things gingerbread and a whole lot of cookies. For some reason though this year I’ve been putting off devising my Christmas cookie game plan. I’m not quite sure why, but I’m pretty sure it has something to do with The Voice being on twice weekly, another season of White Collar hitting Netflix, and the urge to binge-watch anything with Aubrey Plaza in it. Couple having something on the TV with a cozy blanket and Pinterest, and in a flash my “Oh I’ll start planning after this episode” turns into a “WHEN DID IT BECOME 10:45 PM! ?” – in which case it’s Go directly to bed. Do not pass go. Do not collect $200. As we’re already hurtling into mid-December I realized I better get myself in gear, and what better way to do so than with the aroma of baking gingerbread wafting through the house? Only one near hiccup happened when the supermarket appeared to be out of molasses, which really would have been game over on the gingerbread that night, but I reached a hopeful hand up on the top shelf and found one jar pushed towards the back. Whew. Let there be biscotti. 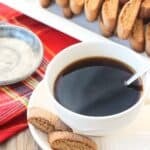 Gingerbread biscotti with a dash of chai. Yeah! Some notes on these cookies: They certainly are crispy, but they’re not rock-hard-break-your-teeth crispy. In other words, you won’t need to dunk them in coffee in order to chew through (but I bet that would taste delicious). They require a little extra baking time, as they take a few shifts in the oven (as biscotti do), and the dough is sticky. Please flour your hands, work surface, and spatulas judiciously or else you’ll be more Bah humbug than Christmas cheer. In a large bowl, mix together your dry ingredients: flour, baking powder, salt, cinnamon, ginger, nutmeg, cloves, and 2 tbsp of the chai tea latte mix. In a separate, medium bowl, lightly beat eggs. Add oil, sugar, vanilla extract, and molasses. Pour wet ingredients into dry and mix until well-integrated. The batter will be very sticky, so flour your hands, spatula, and work surface before removing the dough to work with. Lightly knead dough on floured surface, adding more flour as you need. I worked about 2-3 tbsp of flour into the dough during this process. Once dough is workable, separate into four equal sections. Working one section at a time, roll into a cylinder. 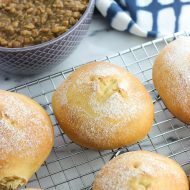 Depending on the stickiness of your dough, you still may need to roll in more flour. Place on baking sheet and lightly pat down so that thickness is even throughout each cylinder. Repeat for 3 remaining sections. Rub some more of the chai tea latte mix onto outside of four sections and lightly press to adhere. Bake for about 15 minutes, then remove. Cut each log into 3/4-inch strips diagonally, then place each cookie onto its side. Bake for an additional 5-6 minutes so that the edges crisp up. Remove baking sheet from oven and flip cookies over onto the other side. Bake for an additional 5-6 minutes, or until edges have browned. Let cool on the baking sheet. 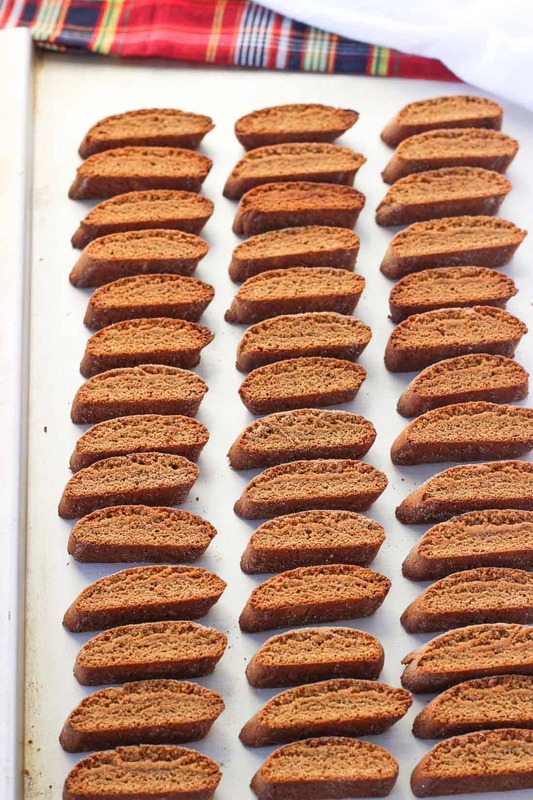 The biscotti won't be hard right when they come out of the oven, but they will crisp up considerably as they cool. These look incredible where do you find the dry chai tea mix. What brand did you use? Thank you in advance! Hi Mary, I used a dry chai tea latte mix in a canister from the Oregon Chai brand. I found it in my local supermarket, but I’ve seen another brand called Pacific Chai that makes a dry mix as well. Not sure if Pacific Chai is in supermarkets or just online at someplace like Amazon. Also if you have a Trader Joe’s nearby, I’ve heard their powdered chai tea latte mix is pretty good, too. I hope that helps! 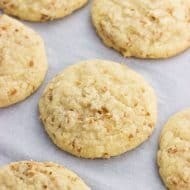 I just saw these cookies on a Shay Realtor email here in San Diego and clicked right on over. They look so yummy. The only problem is I can’t stand gingerbread! 🙁 Is there anyway I can change it to make vanilla chai instead? Hi Cheryll, thanks for stopping by! Vanilla chai sounds like an amazing flavor combination. 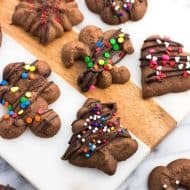 🙂 Hmmm the molasses adds a big part of the gingerbread flavor, so I’d suspect substituting in an equal amount of honey or maple syrup for the molasses would still provide enough liquid and sweetness to the batter. 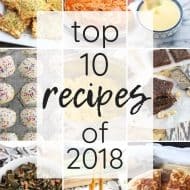 Without the strong flavor of the molasses you’ll probably be able to taste the other flavorings even more, so maybe increase the vanilla extract and chai mix a little bit? Or add a little bit of cardamom to the mix to help differentiate between the chai/gingerbread flavors? Let me know if you end up experimenting – happy holidays!